In recent weeks, Mayor Bill de Blasio’s policies have run up against an age-old forces of inertia and resistance in the city, especially one that springs forth in policy debates on everything from housing to bike lanes to school desegregation and even closing down Rikers Island jails. That force -- NIMBY or Not In My Back Yard-ism -- has taken distinct forms on different issues, but has been causing the de Blasio administration trouble and frustrating the mayor. At the same time, some critics of the administration say that the NIMBYism it is facing is stronger because the administration is not being a proactive, collaborative partner with communities. In some ways, the pushback is more sympathetic, like in cases where communities face real pressures of gentrification and displacement, and in others, less so, like when residents perceive even the smallest change to their neighborhood as contributing to a decline in quality of life. 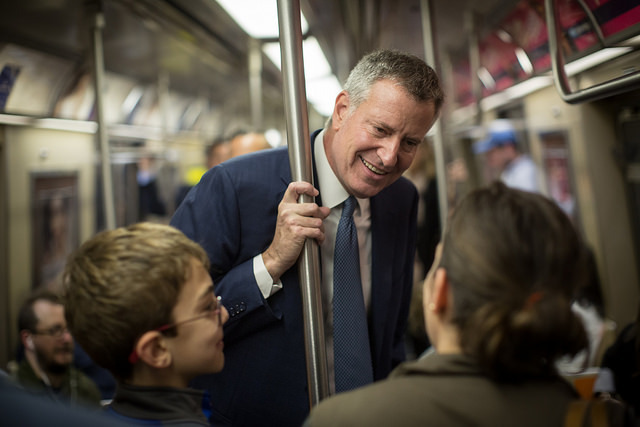 For de Blasio, persistent NIMBYism poses a multi-faceted challenge as he nears the final year of his first term. He has to choose at times to capitulate to demands from communities or local elected officials, and at other times, he must use unilateral but unpopular action that, in the administration’s view, will have long-term benefits. Three recent instances, in particular, highlight this obstacle of NIMBYism to the administration’s larger vision of equity and justice, which can be messier when being applied to neighborhoods than when explained in principle. In the last two months, two rezoning proposals that would’ve added to the city’s stock of affordable housing were nixed by the local Council members for their respective districts, eliciting charges of short-sighted NIMBYism by the Council members and the portion of their constituents they were listening to. The first proposal, in the Upper Manhattan neighborhood of Inwood, was voted down by the City Council in August after Council Member Ydanis Rodriguez opted to reject it. He had signaled support for the project, but appeared to bend to vocal community pressure as his final decision neared. Rodriguez has been an outspoken and active ally of de Blasio’s, especially around the Vision Zero plan to eliminate traffic deaths. It was the first private rezoning application before the city under the newly passed Mandatory Inclusionary Housing zoning rule. Rodriguez vetoed the proposal despite the city and the developers having reached an agreement in which half the housing would be affordable. By tradition, the full Council usually votes with the local member on land use applications, and did so with Rodriguez. In the second case, in Sunnyside, Queens, a nonprofit real estate developer withdrew a rezoning application in the face of opposition from the community and the prospect of a veto from Council Member Jimmy Van Bramer. While Rodriguez defended his decision around the affordability of the proposed units and the added density to the neighborhood, Van Bramer explained his as especially related to the height of the proposed project, as well as the added density and need for related infrastructure improvements. The third example is local opposition to a City proposal to convert a Holiday Inn Express in Maspeth, Queens into a homeless shelter. Residents of the neighborhood are outraged, citing concerns about public safety and the location of the shelter. In an argument central to NIMBYism, many have even said they don’t oppose creating shelters for the homeless, just this particular one. They have protested outside the home of Commissioner Steven Banks, head of the city’s Human Resources Administration and marched to the home of the hotel owner. De Blasio told them to protest at his home, Gracie Mansion. In his weekly segment on WNYC’s The Brian Lehrer Show on September 16, the mayor also addressed the Maspeth controversy, saying the issue of homelessness “brings out a lot of contradictions in people” and said the NIMBY mindset had grown in the city over decades. “And, as someone who’s served here a long time, I don’t have an illusion that we’re going to snap our fingers and make it go away,” he said. The term NIMBY has been used in the past as a pejorative for wealthy white neighborhoods that wanted to avoid any change to their communities that they considered undesirable, including an influx of people. It’s a loaded term that can imply class and racial biases. But, over time, the term has become more common and has evolved beyond its original meaning. “Just as the rain falls on rich and poor alike, NIMBYism is found among the rich and poor alike,” said Kenneth Sherrill, professor emeritus of political science at Hunter College. The difference, Sherrill pointed out, is that with low-income communities, their NIMBYism is largely founded in justifiable concerns about gentrification and rising rents that contribute to displacement. That was one of the elements at play in the Inwood rezoning proposal." It is an undisputable fact that NIMBYism is universal and has cropped up all over the city in various policy battles. Earlier this year, proposals to expand the CitiBike program into Brooklyn faced local opposition that smacked of NIMBYism. A caller from the mayor’s home neighborhood of Park Slope called into WNYC on Thursday morning to tell him the new bike installations there were a problem because they took away needed parking. Similar efforts in the form of lawsuits have been launched since the city announced the CitiBike expansion in 2014. Another lawsuit, against bike lanes installed by the city in Park Slope, was withdrawn just last month after stretching for six years. Especially in more controversial discussions, such as the plan to close down Rikers Island jails, NIMBYism is a significant factor. Although there is fairly widespread agreement on shuttering the doors of the prison complex, elected officials do not generally favor relocating inmates to community-based facilities. The Speaker of the City Council, Melissa Mark-Viverito has a commission in motion to create a long-term plan for shutting down Rikers jails, the notion of which has already faced local backlash. Addressing affordable housing-related rezonings, Mark-Viverito recently said that the de Blasio administration needs to be more proactive in engaging with City Council members and their communities. The city’s movement to rezone some schools with an eye on desegregating nearby schools has met NIMBY detractors in Downtown Brooklyn and the Upper West Side, though other critics say that the administration has not moved quickly or comprehensively enough on the issue overall. But in issues of land use and infrastructure, NIMBYism is perhaps most consistently pronounced, on both sides. On the one hand are more well-off neighborhoods opposing facilities that have historically saturated low-income communities, like homeless shelters and waste processing centers. On the other hand, are low-income communities resisting the march of gentrification across the city and opposing infrastructure that would put further pressure on their neighborhoods. Eddie Bautista, executive director of the New York City Environmental Justice Alliance, sees a lot of NIMBYism in his line of work. His group advocates for a more even-handed distribution of burdensome city infrastructure that is often clustered in low-income communities of color. These efforts, more often than not, come up against some or another form of NIMBY opposition. Lander said the opposition in Maspeth may be the “most strident” example of NIMBYism and said each neighborhood has a fair share obligation to house the homeless. The administration has identified 250 homeless people whose last known address was Maspeth, but the community has no fixed shelters. “It’s not only about not getting more than your fair share but doing your fair share,” Lander said. He also sought to dispel the notion that recent “noise” or even past opposition were hobbling the administration’s progress on its larger core agenda. Norvell pointed to the expansion of affordable housing and CitiBike, “both instances where the NIMBY phenomenon surfaced itself in various degrees of intensity but our policy and political goals were achieved nevertheless.” Under the affordable housing agenda, about 53,000 units, a quarter of the goal administration’s ten-year goal, have been financed and CitiBike is on course to double capacity, Norvell said. The moment of insecurity that both Norvell and Lander speak of may not just be for everyday New Yorkers. It’s a challenging time for the mayor as well. He’s fast approaching reelection and can ill-afford to make unpopular decisions. His relationship with the City Council has become more challenging, particularly after he expressed some public dismay with Council Member Van Bramer over the Sunnyside deal (while also expressing respect for Van Bramer). Affordable housing is one of the main planks on which he has expended significant political capital, and must continue to do so in various local battles. At a press conference on September 14, asked about the success of a housing proposal in the Bronx and the failure of Inwood, Speaker Mark-Viverito defended the leverage that Council members hold over land use decisions and seemed to criticize the mayor. “The mayor and the administration need to focus on being proactive and engaged with Council members in their districts and with the communities that we represent to make sure information is being arrived at in the most transparent way about what a project is and what it seeks to do, that needs to happen,” she said. But she also stressed that local decisions must involve dialogue and engagement with the communities that are affected, even if they don’t agree. “And I have found that when you really engage in that conversation and take the time to really explain the process of your thinking and why, even if people don’t agree with you they’ll respect that, and you can work with your constituents and navigate through that,” she said. Mayor de Blasio does seem to be taking some of these critiques to heart. He has stepped up his efforts at personally engaging with New Yorkers. 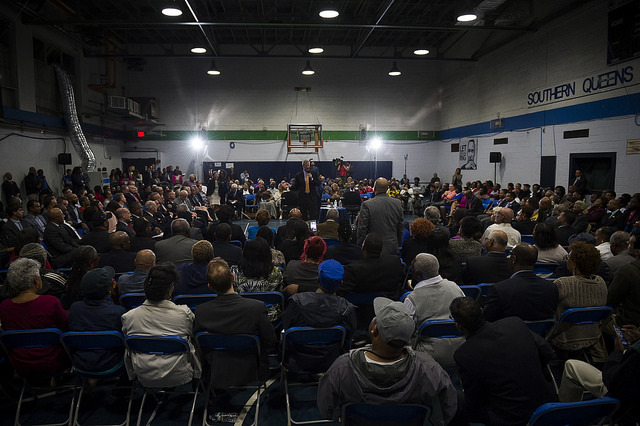 Besides his weekly radio appearance, where he takes questions from callers and promises assistance to those who need it, he has hosted a number of town halls in the last few months, connecting with people more directly in all five boroughs. “For neighborhood planning, I believe it’s better to engage people more and sooner,” said Council Member Lander, who thinks the administration has shown strong participation in certain proposed rezonings, including Gowanus, Bushwick, Far Rockaway, and East Harlem. Norvell contends the administration has made “honest and sincere” engagement efforts in city planning, and that the ultimate goal is to “do the most good for the most people.” “At the end of the day, you can’t make everybody happy,” he said.